Rachel Lehmann-Haupt reviews Finding Our Families by Wendy Kramer and Naomi Cahn, J.D. A friend recently commented to me that choosing single motherhood with a donor or minimally viable dad today is the equivalent of “Starbucks coming to the East Village,” meaning it’s a formerly edgy neighborhood now turned mainstream and populated with a household name brand. Starting your family as a single mom by choice, or SMC—a term coined by New York psychoanalyst Jane Mattes in the 1980s to define a woman who consciously decides to conceive and raise a child on her own—is fast becoming just another kind of family. After all, the traditional Father Knows Best nuclear family now represents only 20% of the nation. New combinations that include two mothers, two fathers, loving step-parents, committed nonmarried couples, single dads, and financially stable SMCs have replaced the traditional nuclear family. The number of college-educated single moms who make up this group is small, but according to Lucie Schmidt, an economist at Williams College, the numbers are growing along with the larger national trend. In 2005, there were 47,402 first births to college-educated unmarried women. By 2010 (the most recent year for which the data are available), there were 59,955. 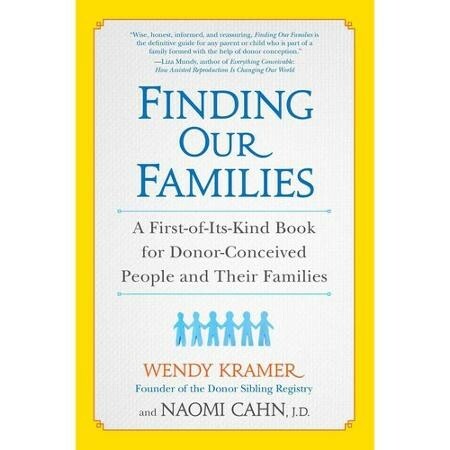 In this new world, I applaud Wendy Kramer, the cofounder of the Donor Sibling Registry, and Naomi Cahn, a family and reproductive law professor at George Washington University, for writing an informative guide for the growing number of families with children conceived by donors. The Donor Sibling Registry is an online community that matches donors and offspring so that siblings conceived by the same donor can find each other if they choose. Kramer and Cahn offer no-nonsense advice, strategies, and stories to help parents who are navigating their own and their children’s questions. The most vital takeaway from the book for anyone considering starting a family via this route is to be honest from the beginning. The book offers a vital peace of mind from both a personal and legal perspective, and is a must-read for anyone with children conceived by a donor or who is considering the choice.